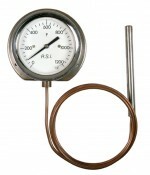 Mercury in steel, bi-metallic or nitrogen-filled dial thermometers with stem or capillary and connections to suit any application. Mounting arrangements can be fixed rigid with either bottom or back entry, panel or surface mounted for capillary models or magnetic. Liquid filling can be provided to reduce vibration of the temperature indicator needle. Measuring ranges from -40°C to 650°C.